Like many hunters and shooters, I’ve missed a few times over the years, maybe more than a few times if truth be told. Those misses have been caused by a variety of reasons, including not properly calculating the correct hold on game, especially at longer ranges. To prevent missing shots, I’ve tried many ways to improve, from reading books to getting training, and even purchasing new gear. I’ve also spent numerous hours at the range trying to become a better shot by learning to calculate dope on my rifle for when a shot presents itself at a distance on the far range of my knowledge. During those hours at the range, I worked on understanding the ballistics of my rifle, such as drop, energy and velocity, as well as how weather conditions affect these factors. I also worked on learning how wind affects bullet placement in a variety of situations, including headwinds, backwinds and even crosswinds. I even looked into products that could help me shoot farther and more accurately, which is how I found Ballistic. 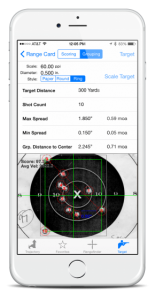 Ballistic is a mobile application for iOS devices, such as iPhones and iPads that can be used to determine shot placement by automatically calculating dope through the world-renowned JBM ballistics engine. 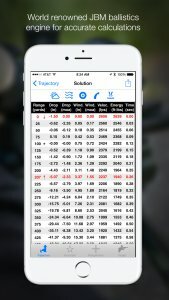 However, this App is much more than just a basic trajectory calculator, as it also provides information on weather conditions, scope reticles and includes a proprietary ballistic library with the corresponding performance data for more than 5,300 projectiles, factory loads and military loads. It even includes the latest commercial data and G7 military coefficients from the Aberdeen Proven Grounds, as well as Bryan Litz’s Custom G7 ballistic coefficients and projectile length data. A key area where Ballistic differentiates itself is its support of handloads. Users can input their own handload data, and all of this can be calculated and compared with up to eight different loads in a graph. Of course, all this is really great, but all I really care about is whether it really works, and if it is easy enough to use to be realistic. 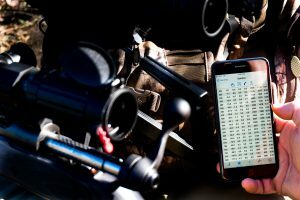 Now ballistic calculators absolutely work; this has been proven by military snipers and other long-range shooting enthusiasts. However, the average hunter seldom shoots beyond 200 to 300 yards, with many shots at game taken within 100 yards. And even though I have shot deer as close as 20 yards with a rifle, I have also both connected and missed on deer at 300 yards and beyond, and have even spent hours putting holes in paper out to 800 yards in a variety of conditions. And it is at these longer distances, both at paper and game, where Ballistic shines. After downloading from the Apple Store, I immediately plugged in the information on my DPMS Panther A4 in 5.56×45 mm and my Remington 710 in .308 Win. Finding my chosen loads was simple, as the exact load was listed by caliber and manufacturer. Ballistic even had a listing for auto selecting the best load for wind drift, flatness and energy. I then measured and entered the height of my scope and headed to the range for testing. There, I enabled Ballistic to pull the weather conditions for the range and sighted the rifle 1-inch high at 100 yards and tapped calculate trajectory. The chart showed all necessary dope for the load, including temperature, barometric pressure, altitude, even wind angle and velocity. 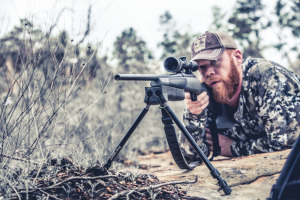 The chart also showed that the complete zero on the rifle would be between 150 and 175 yards, and an effective distance of 250 yards in the kill zone of a deer, if the sight was held dead center. What was truly interesting, though, was that I could change zero height to determine the best sight-in height for the optimal distance of how I wanted to hold. Since I like to be able to hold the reticle on the target, or at the top of the target, out to 300 yards, the best sight in height for how I like to shoot was 2.5 inches at 100 yards. This gave me a bullet drop of 7.18 inches at 300 yards, allowing me to hold around the top of a deer with confidence that the bullet would hit in the kill zone. Even better, Ballistic allowed me the opportunity to swap between different loads to compare and determine which would be the best for my needs. It also saves the weather conditions from the range day, allowing comparison and calculation to the conditions in the field, including how altitude changes trajectory and bullet placement. Tests with my AR-15 exhibited similar results with my standard load showing an optimal zero height of 2 inches at 100 yards to receive the results desired. What was truly surprising, though, was how much Ballistic was able to increase my confidence in both my ability and rifle. Saving the trajectory chart into favorites provides a fast reference for hold over at distances out to 1,000 yards. In fact, Ballistic will calculate trajectory out to 5,000 yards, with loads capable firing to this distance — think .50 BMG and .338 Lapua Mag. Now there are some features of Ballistic that I haven’t tested in depth yet, but most are pretty easily understood, especially for the average hunter. My two favorite additional features have to be the Heads-Up Display and Advanced Rangefinder to support quick adjustments and a real-time readout in the dynamic display. For those passionate hunters and shooters that ask for more, Ballistic delivers. Ballistic’s Advanced WindKit can account for up to eight wind sources enabling shooters to account for nearly any possible wind scenario. Simply tap the screen each time to create a new wind zone then slide to the appropriate range for speed and angle. A further tap of the screen will incorporate the Coriolis Acceleration, the impact of the spin of the Earth, required for calculating extremely long shots. In testing on the range, the calculations have been spot on, with bullet drift showing exactly on paper where the App stated it would be. If wind drift on the trajectory chart showed 1-inch left of the point of aim, that is where the bullet would pierce the paper. I hope to use this in the field on some upcoming wester hunts where multiple wind variables can play havoc on bullet flight. Handloaders will appreciate the capabilities of Ballistic as well. I recommend to first measure the actual velocity through a chronograph in order to get the most accurate data, as every rifle shoots loads differently because of barrel length and quality of the gun. A .308 Win. round coming out of an 18-inch barrel will have a different velocity than when traveling out of a rifle with a 22-inch barrel. 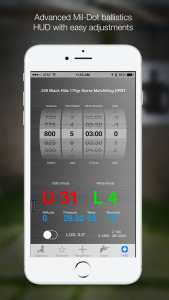 With this data, you can now fully customize your loads in Ballistic and get the most out of the app. Now missing is pretty much considered part of shooting, as there are so many factors that determine whether a bullet sent downrange will land where aimed that have nothing to do with velocity, range or trajectory, such as ability, the shooter’s physical conditioning and the inherent pressure of making the shot with required. There is nothing any App or device can do to regulate these factors; these are strictly in the hands of the shooter. However, Ballistic can absolutely provide the necessary dope on a rifle and load combination that show where to hold to make a shot at almost any realistic distance, whether competing, putting game in the larder or just ripping holes in paper at extreme distances. It can even increase confidence, as the trajectory charts shows, specifically, the capabilities of a load. It sure did that more me, and will continue to do so in the future. Whether becoming a legend amongst friends on the range, or taking down the prized trophy that may be on another ridge or deep in a valley. Ballistic is that elite spotter every shooter strives to have. Right at their finger-tips for each and every shot. The most aggravating moment while hunting — missing the shot! Shooting at distance, 100 yards and beyond, requires consideration of many factors, such as range, wind direction, temperature, velocity, bullet drop and more. When you get down to it, there can’t be too much information. There are various ways to determine dope for rifle shots, some still do it by firing at paper targets, the easiest, however, is with a Ballistic Calculator. The best one out there — Ballistic, a mobile application for your phone or tablet. Ease of use is paramount and being able to quickly dial in details will make the difference when lining up that perfect shot, Ballistic more than meets this requirement. Getting started is easy with just a few simple variable inputs and taps of the screen, a shooter will be on their way to taking those impressive shots one only hears about on television and in movies. Follow this simple step-by-step outline to getting started with Ballistic. A robust set of instructional videos are also available at Ballisticapp.com. A simple tap on the location icon at the top of the page and Ballistic will draw all the needed weather conditions at the shooter’s position from the nearest weather station or paired device.